New religions: Journey to Virginland and the power of enlightened engagement. Is Melikian founding a new religion? Cemeteries across the world speak loudly of the devastating toll of religion. Yet new religions continue to mushroom, and people seem as ever eager to kill and die for their religious beliefs. Today new religions proliferate to supplant old ones, to establish alternate ways of life, to claim their own monopolies on existential or metaphysical truth. 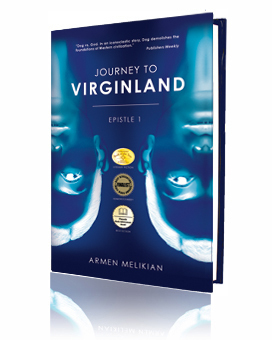 In Journey to Virginland, his unconventional, pioneering 2012 novel, which earned him the “attention” of the KGB even while he was working on his manuscript, Armen Melikian lays out a wonderfully self-actualizing, embracive vision of being and becoming that eschews the vestiges of conventional religion yet inspires what might be termed as religious sentiment, insofar as the author proposes harmonious emotional, intellectual, and spiritual engagement in life’s joys and sorrows alike. “Will you establish the temple of HAY on Ararat—for the countless millions of descendants of Hayk’s twelve sons and daughters, for the whole of humanity, for she who hears HAY’s voice in her soul? A house of the spirit cannot be a house of race,” is one of the cogitations of the novel’s hero, Dog Son of Dog, which interrogators of Melikian’s wife at the KGB headquarters in Yerevan confronted her with, several years before the manuscript was even completed. She has been threatened to be charged with treason unless she cooperated with them. “This is not our book; he is not one of us,” one of the interrogators shouted at her. The interrogators were equally peeved by the sexual content of the novel. Melikian was made a persona non grata and subjected to an appalling persecution in the country of his ancestors, where he had moved from the United States in order to continue his research on the prehistoric layers of the Armenian epic, The Madmen of Sasun, and reveal its roots as a cosmogonic poem of priestly origins holding the key to the mysteries of the Zodiac as a cosmic calendar. Without a search warrant, the KGB operatives invaded the home of Melikian’s confidante to confiscate his manuscripts and legal documents. A physical altercation ensued. She was later forced to listen to wiretapped conversations between the author and “other women” (apparently his conversations with the woman whom he later married). A scholar and fierce critic of the Judeo-Christian tradition and other monotheistic systems, Melikian systematically exposes in a satirical novel the grand corporate sham of organized religion and raises red flags against the prowling orthodoxy of new religions. Nevertheless, unlike many who reject conventional religion outright, Melikian often qualifies his critique with specific nods to religions extinct and extant, chief among them Buddhism, Zoroastrianism, and the ancient Armenian religion. Melikian seems to be interested in neither bringing yet another addition to the labyrinth of new religions nor, more broadly, perpetuating the insidious practices of control and exploitation spawned by organized religion. Instead what he seems to expound, far from the impulse of new religions, is a dynamic approach of enlightened engagement, energized by an ethos of experiential curiosity, creativity, compassion, and a quest for the serene. Interested in reading more about new religions or Journey’s HAY? Get your copy of Journey to Virginland today!